Hofesh Shechter's Political Mother (Oct 11—13) is the Israeli-born, British-based choreographer's longest work thus far, at 70 minutes. It is a full expression of two of the artist's particular skills—obviously, movement making, but also as a trained percussionist and composer. 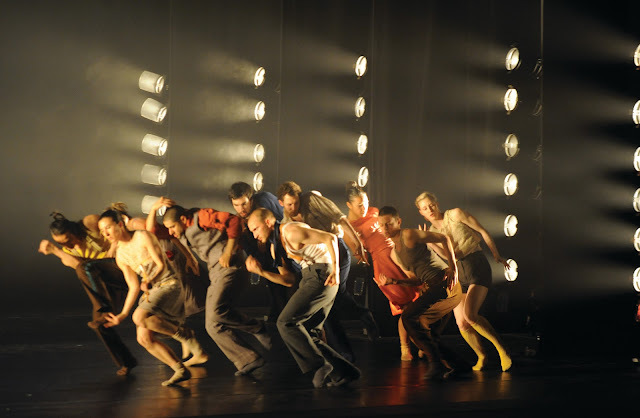 Shechter has called it "a big celebration of lights, of movement, of music." If you're a BAM regular, you've probably experienced a work of dance theater that connects with your body, your brain, and your neural synapses in equal measure. These might include any of Pina Bausch's pieces (coincidentally, "... como el musguito ..." opens on Oct 18), Ohad Naharin's engrossing dances for Batsheva Dance Company (where Shechter danced), and Sasha Waltz's poetic and spectacular movement dramas. The role of music in Political Mother can't be overstated. Shechter himself cops to being inspired by a drum riff from Peter Gabriel that he liberally interpreted and recorded, and that became the seed from which the score sprouted, in the process earning the moniker "the end of the world" loop. He also tosses into the sonic mix imagery of "an old Egyptian band of strings" and tons of drums and electric guitars. The dance—primal, powerful, explosive—almost seems to inhabit this room built of epic, melodramatic sounds. It's suspended onstage-—sometimes in a web of light that might rival a stadium at night, and other times in a foreboding velvety darkness. No matter what your take will be on the critically-praised Political Mother, you'll have an opinion about it. Just prepare to be moved.